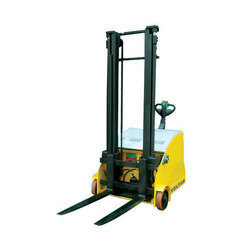 We are authorized channel partner of VOLTAS - KION range of Diesel forklift for MP region. We are authorised channel partner of VOLTAS - KION range of Diesel forklift for MP region. 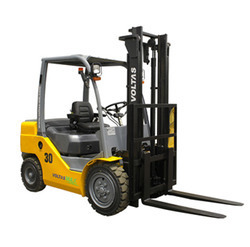 VOLTAS make Electric Forklift 1.5 Ton And 3.5 Ton @ 500 load center Forklift different lift height varient 3000MM to 6000MM and robustic exsel heavy duty forklift . Ac motor high powered ,split rim desine sindle motore for hoist and steer operation , dual controller system . The DVX 50 Series, with the upgraded BS III engine capable of lifting upto 5T offers you best of everything from Fluid coupling transmission to best in class hydraulic system. With the DVX 50 you have at your disposal a machine that will offer you Higher Reliability, Higher performance and Higher productivity than any other machine its class. The DVX 50 Max Series, with the upgraded BS III engine capable of lifting upto 5T offers you best of everything from Automatic transmission to best in class hydraulic system. With the DVX 50 you have at your disposal a machine that will offer you Max Reliability, Max performance and Max productivity than any other machine its class. Powered by a 4 Cylinder BS III Engine, The DVX 806 Series comes with an Power shift transmission with constant mesh gearing. The Self energized Air operated brakes add on sophisticated hydraulic system, offering you Higher reliability, Higher performance and Higher Productivity. Powered by a 6 Cylinder BS III Engine, The DVX 1006 Series comes with an Power shift transmission with constant mesh gearing. The Self energized Air operated brakes with a sophisticated hydraulic system, offers you Higher reliability, Higher performance and Higher Productivity than any machine in its class. Powered by a 6 Cylinder BS III Engine, The DVX 1512 Series comes with an Power shift transmission with constant mesh gearing. The Self energized Air operated brakes witha sophisticated hydraulic system, offers you Higher reliability, Higher performance and Higher Productivity than any machine in its class. Part of the Voltas MAX series, The Voltas MAX KAT Model has everything to make it India’s Most Fuel Efficient Forklift in its class. 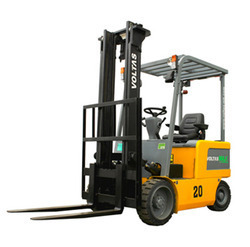 This modern looking forklift is built on World Class technology from KION in Driveline technology and performance. Specially designed for Today’s generation of operators, The Voltas MAX 30 KAT offers top-of-the-class ease of operation as well as comfort, with its clear visibility mast, the single electronic gear shift and numerous other features like such as deluxe adjustable seat etc. The Voltas MAX 30 KAT utilizes an Indigenous BS-III compliant engine which offers performance like no other in its class, adding to the modern generation requirement of “MAX Power, MAX Performance, MAX Productivity”. 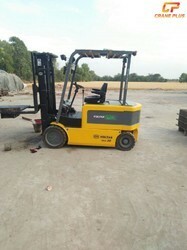 The only Fully Automatic Forklift, “Manufactured in India”. 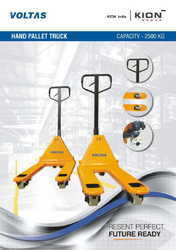 The Voltas DVX FC Series capable of lifting loads 1.5t to 4T, the DVX FC Series uses the Voltas Patented Fluid Coupling Technology in its indigenous drive unit, coupled with a BS III Engine to provide you with unmatched Reliability, Performance and Productivity in any forklift in its class.